Julian Müller, in his advocacy of a narrative theology, has called for an autobiographical theology. In addition to Julian Müller's plea, the author turned to what may be seen as the liturgical and ritual variant of this method, namely autoethnography. Thus he would honour Julian Müller and his tireless commitment to Practical Theology. Autobiographical and autoethnographical theology do not start from well-ordered and systematically arranged knowledge, but from a life as it has developed and as it is developing in its connections with others. Difference is therefore a keyword in the method. Others and other worlds evoke the consciousness of differences, incite reflections on the cracks, fractures and fissures that show themselves to the self and provoke negotiations with the otherness of the other. Never in his existence as a theologian had the author experienced this process more intensely than in his contacts with colleagues and religious practices in South Africa. It was described in the article how the author became acquainted with South Africa and, more particularly, with its liturgical rituals and visual arts since 2001. The different experiences of successive visits to Church Square in Pretoria functioned as a point of reference in the article. It was shown how the self re-negotiated its position in the world through the confrontation with a totally 'other' - in this case, South African liturgical rituals and visual arts. This re-negotiation focused on the Western academic position of the self when confronted with African epistemologies and ontologies. On my father's desk in our house in the Netherlands there was a tobacco jar about 25 cm high. 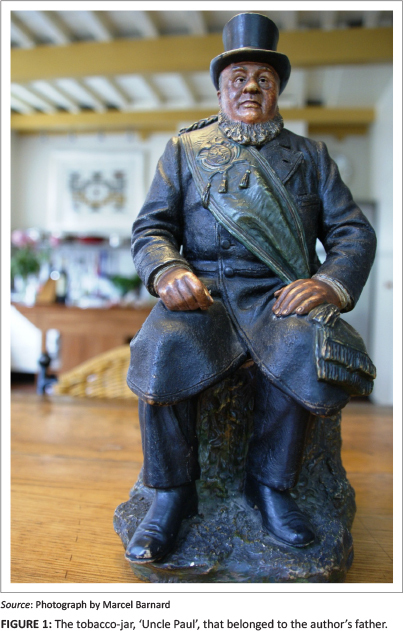 It was an heirloom from his grandfather and it was always referred to in the family as 'Uncle Paul' (Figure 1). It depicted a man sitting on a tree stump wearing a top hat. The torso could be lifted and then the hollow stem became visible. As a child, I never thought about the origin of the name of the tobacco-jar, or even why a tobacco-jar should have such a personal name. Only when I was in South Africa for the first time in 2001 as a middle-aged man visiting the University of Pretoria and standing in Church Square under Anton van Wouw's similar statue of Paul Kruger, did the circle close. In the Kruger House Museum on Church Street, I again saw an exact replica of my father's tobacco-jar, as an example of objects that, in particular in the Netherlands, were sold to support the Boers during the South African Wars around the turn of the century, or more precisely the wars between the Boers and the British in 1880-1881 and 1899-1902. At home again, the bookshelves of my parents appeared to include a commemorative book of the South African War that my great-grandfather had bought, apparently also in support of the Boers. In 2001, I simply did not understand why that statue of the president of the Boer Republic was still there on Church Square in Pretoria, in the new South Africa, which presented itself at that time as 'the rainbow nation'. During that first visit, it was indeed not only the memory of the 'Uncle Paul' tobacco-jar that came to my mind, but also, and even more so, the memory of my high school days in the Netherlands in the 1970s, when we protested violently against apartheid and the posters promoting the boycott of South African oranges (Figure 2) hung everywhere at school: a black head that was squeezed on a juicer ('Eet geen outspan sinaasappelen. Pers geen Zuid Afrikaan uit - [Don't eat Outspan oranges. Don't squeeze a South African dry]). And, of course, the emotional and most televised moment that we had seen live on television in 1990 continually came to my mind: Nelson Mandela, who, hand-in-hand with Winnie Madikizela-Mandela, walked out of the Victor Verster Correctional Centre in Paarl. Even now that I am writing this, 23 years later, it stirs many emotions within me. Those steps into freedom were, 10 years later, in 2011, inscribed into my own body when I, together with Ian Nell (who beat me easily), participated in a 10 km 'Freedom Walk' run from that same prison - a hard run for a Dutchman, who is used to a cool climate and flat surroundings, on a really hot morning in an undulating landscape. At that time, South Africa already had become my second home, and one for which I am always homesick when back in the Netherlands. In Liturgical Ritual Studies we use ethnographic methods. In addition to Julian Müller's plea for an autobiographical theology, I turn, in this article, to what may be seen as the liturgical and ritual variant of this method, namely autoethnography. Thus I will honour Julian Müller and his tireless commitment to Practical Theology. In this article, I explore my contacts with South Africans and my travels across the country, but I do so from the perspective of, and as a member of, the Dutch academic community that has a long tradition of cooperation with universities in South Africa. In considering the consequences of autoethnography, Holman Jones (2005:767) points to the interest of 'emotions ... to understanding and theorizing the relationship among self, power, and culture'. In their turn, 'autoethnographic texts seek to invoke the corporeal, sensuous, and political nature of experience rather than collapse text into embodiment' (Holman Jones 2005:767). Thus, these texts aim at changing the personal and communal life; in other words, aim at transformation by means of their performative power. Autoethnography purposely strives at an output that is performative; the author is a performer, staging a performance. Thus autoethnography is not at all a value-free science, but invites scholars to write very concrete and detailed texts to 'stage arguments, to embody knowledge and politics, to open a community to itself and the world in ways that are dangerous, visceral, compelling, and moving' (Dolan, in Holman Jones 2005:784). For students in Liturgical and Ritual Studies, bodily participation in the rituals that are investigated is a prerequisite. I have gradually become familiar with this methodological insight; in the years that I have taught at university, Liturgical Studies has changed from a mainly text and book-centred discipline into an empirical science that starts from the rite as it is performed. However, the power of this methodological understanding and its consequences for epistemology and ontology is not fully realised until one participates in a completely 'unfamiliar' rite. All too easily, my Dutch theology students - with whom I broadly share a perception of liturgy as performed in a neat church building with a pulpit, an organ and chairs or pews - and I will not find it necessary to explain to each other how the organ or the layout of the church building affects our understanding of liturgy. But coming back from Africa, after having participated in the liturgical ritual of an African indigenous church, I was simply no longer able to explain what I had experienced. To feel the thumping drums and to experience the endlessly repeated rhythm physically in a worship service in an African indigenous church, is quite different from reading about it and theorising about the place of music in traditional African liturgy. The monotonous blowing of the vuvuzelas that lasts for hours is forever in my ears, without me being able to discursively explain its effect on me. I remember quite well how the circle dance in a Xhosa rondavel that served as a church building moved me to tears, somewhere deep in the green hills of the Eastern Cape, where I was on a Christmas morning. And although I fortunately did not have to participate in the dance itself, I felt more part of a community than I had felt for a long time back home in the Netherlands. Undoubtedly, this feeling is connected with the great hospitality with which I was received each time; arriving somewhere and seeing with your own eyes that a sheep or a chicken is slaughtered just because of you and others, visiting, brings one very close to the awareness that hospitality and a guest meal require a sacrifice: precious life has been cut for it. Literally so, as sheep and chicken represent a huge economic value. It also brings the huge economic differences between people on the globe to the fore; the reverend of this congregation worked in the mines of Johannesburg and had travelled to Cape Town by bus once in his life, but I know for certain that I will fly back to Europe and return next year. The heat in the small and dark hut and the smell of sweat from the dancing bodies unmistakably comes back into my memory when I write these words, but that is a weird (recollection of an) experience in an air-conditioned modern university building in Amsterdam's banking quarter. In short, my getting acquainted with liturgical ritual in South Africa has changed my performance as a teacher of university students. My lectures in Liturgical Studies are no longer primarily about texts that should be embodied and performed by the future ministers that we educate, but first and foremost point to 'the body (that) "minds" itself' - a quote from Theodore W. Jennings (1996:327), of which my colleague Cas Wepener, also from Pretoria University, constantly reminds me. Jennings (1996:333) emphasises that ritual knowledge is 'to know reflectively what is known ritually, to re-cognize ritual knowledge'; that knowledge cannot only discursively be reported about, but asks for poetics, images, footage and other ways of expression. It thus also challenges the boundaries of science and introduces the artist into the realm of the university. The arts are an important way for me to relate myself to the world, even when back home. To become familiar with South Africa, my reading of literature and encounters with art and artists helped me as much as academic contacts and joint research projects. African literature has also familiarised me with at least one of the languages of the country, Afrikaans. Antjie Krog, N.P. van Wyk Louw, Cas Vos, Chris Barnard, André Brink, Dalene Matthee, P.G. du Plessis, Karel Schoeman and Dan Sleigh were guides through unknown regions and on untrodden paths. The colours of Africa are different from the colours of Europe and they reflect different spiritualities. The depth of secularism really dawned on me when I noticed the ubiquity of religion in Africa. There was another painter of the South African landscape that touched me from the beginning, Van Wouw's ward, Jacobus Hendrik Pierneef (1886-1957): his abstract canvasses of the hoogveld [highveld] with a violet palette open the huge spaces of the scenery, but evoke a far more distanced spirituality. I would say the landscape is revealed in its inaccessible and awesome grandeur, but not entered. It suggests a numinous majesty, but the spectator does not become intimate with it. The violet always gives way, the horizon always moves to the background and pushes one single tree to the fore, only to emphasise the endlessness (Wepener & Vos 2013).1 Vermeiren enters the landscape and the spirits that inhabit it, the spectator becomes intimate with it and its inhabitants. Pierneef's almighty and exalted, inaccessible divine becomes, with Vermeiren, the personal and accessible spiritual. Are the meetings of Pierneef and Vermeiren in my biography the meetings of a classical-reformed God and a spirituality of Africa, the meeting of the South Africa of the Boer Republics and the new South Africa? I do not know the precise answers to these questions, but I know that the violet of Pierneef and the ultramarine and earthly red of Vermeiren have posed the questions to me. In both cases, the encounter with Africa was an embodied meeting via colour, that is, via the physical eyes. It was of particular interest and encouraging to me to meet two painting colleagues in Practical Theology at the University of Stellenbosch, Johan Cilliers and Danie Louw, with whom I could dialogue over the inadequacy of discursive academic output to understand the world and its religions and the necessity of embodied ways of practicing theology. A final important meeting with a South African artist took place last year, through Helene Smuts of the 'Africa meets Africa' project (Lekgoathi et al. 2008).2 She introduced us to Esther Mahlangu (born 1935) (Figure 3), a Ndebele artist, who, according to African Success (2008), has exhibited all over the world, for instance in Centre Pompidou in Paris, France, in Germany, Italy, Scandinavia, Japan and the USA. 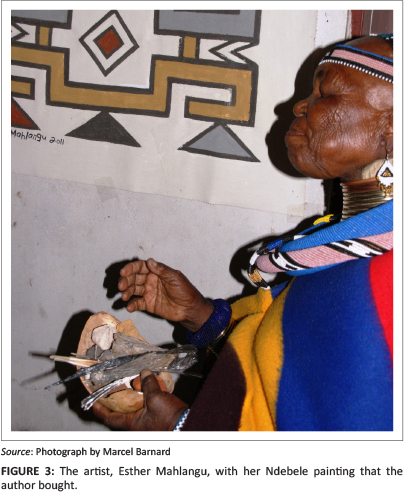 She has also painted cars for BMW and Fiat in the typical Ndebele geometric structures. 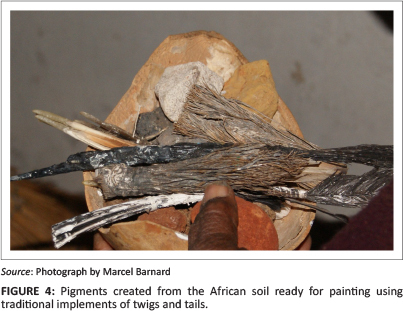 Using the pigments from the soil (Figure 4) in her native village, she makes them with cow urine. This passage refers, of course, to the complex politics of contested land distribution that the country is facing nowadays. It is claimed in the project, that this shattered and virtually enslaved people, kept and reinvented their own identity by intensifying 'distinctive styles of beaded adornment, the resourceful architectural solutions and the wall paintings they created around rites of passage. In this way they maintained Ndebele identity' (Lekgoathi et al. 2008:28). Evidently, the reinvention of ritual is always bound up with changing social and political contexts. Identity formation, in this case, appears to be directly connected to colonial and usurpative behaviour of the White minority. Being the guest of Esther Mahlangu, I realised what it meant to be able to meet her and buy a painting from her. We bought a piece of art, containing South African soil and cow urine, processed into an abstract painting of an - under the influence of 'Uncle Paul's' politics - reinvented Ndebele tradition, by an Afrikaans-speaking artist, who as a world-famous artist has become a symbol of the new South Africa - the best digital biography of her is on a website called African Success (2008) - and back in the Netherlands we hung the painting not far from my father's tobacco-jar. Thus, 'Uncle Paul' also lost his safe haven in our home in the Netherlands, where he is also forced to look the new South Africa in the face. We embedded him in the new South Africa. He was brought home again. In 1900, he was received in the Netherlands as 'a tragic old hero, the hero that everyone had closed in his heart, but for whom no one could do anything' (Bossenbroek 2012:429). We made him part of the history of the new South Africa. Meetings with South African people also challenge my Western ontological and epistemological perspectives. This also holds in particular for the research that I performed with, amongst others, Cas Wepener, in the African indigenous church mentioned before. A worldview in which ancestors, spirits and healings also form part of the world - and in which drums, dances and bodily performances take the place that rational words and restrained physical performances mainly take in the Western world - allows you to question your own assumptions. What does it mean when people join the church that we investigated mainly because of its healing powers and rituals? How does that affect my own theology with regard to the healing power of Jesus? What does it mean when these people convincingly connect to God and each other by means of the drums? How limited is my own, word-centred, discursive theology? Having been touched by this worldview and having got acquainted with people who simply do not question their ontologies and epistemologies, or who, in a Kantian sense, are non-critical because they do not modernly distinguish between the different realms of knowledge, has changed my own performances as a Western research leader and professor. I am convinced that meeting people from other cultures, and exploring the differences between them, on a modest scale contributes to human flourishing and world peace, because it changes people eventually. For this reason, I exert myself to promote, continue and expand cooperative academic research, as well as the exchange of academic staff and students, especially with other continents. I am well aware that I am standing in a long tradition of student and staff exchanges between South Africa and the Netherlands (Schutte 2005; Van Oel 2011). I am also aware that there are interests at stake in academic cooperation, certainly in cooperation between theological institutions. Knowledge is an economic value. Now that Christianity is dramatically shrinking in Europe, Africa, with its spectacular growing Christianity, has become an interesting partner. But here also lies the danger of neo-colonialism lurking around the corner. Collaboration requires real commitment and solidarity, without giving up your own identity. Quite familiar with and enthusiastically engaged in the requirements of Western academic business, I have learned to see, on the one hand, its blessings (Western knowledge, for example as it is instanced by medical sciences, has highly improved the world), but, on the other hand, its limits and unproved assumptions (Western knowledge is overwhelmingly dominant, and the more data it collects ['big data'! ], the more the question presents itself whether it leaves sufficient room for human creativity, love, compassion and probably also religiosity) (Cukier & Mayer-Schoenberger 2013:40). As a consequence, I had to renegotiate my position in Western academic discourse. It resulted in what I felt as an urgent need also to explore the creative and artistic sides of myself, more specifically - as I turned to painting - to discover the spectrum of colours that were hidden within myself. Let me turn back to Church Square and my first visit to that heart of town, 14 March 2001. Back in my memory, Church Square was a no-go-area at the time and my pleasure to see a life-size version of my father's tobacco-jar is connected to a hasty photo opportunity whilst a car stood nearby waiting. I kept a diary during that South Africa journey and I found my description of Church Square, written the same evening in that notebook. It appears that a theology student, at the request of the then Dean, Cas Vos, had driven us through the city in a bakkie that he had borrowed from his brother. The comment that I wrote reads: 'The crime rate in the city (and also in rural areas: some 600 farmers are murdered every year) is so high that you cannot go in there.' Then it goes on in my handwriting (it was before the time of travelling around the world with a laptop) about car hijackings and bank robberies. The visit to Church Square only gets one sentence, which reads as follows: 'We drove into town, on Church Square. We got out of the car to take a picture of the statue of Paul Kruger (Van Wouw, 1899): it is the "Uncle Paul" of the tobacco-jar back home'. Also the Union Buildings get one sentence, referring to the green lawns, the flowers and the inauguration of Nelson Mandela. A visit that same day to the Voortrekker Monument I render with strongly negative qualifications in my diary: 'Wrong symbolism and wrong aesthetics'. It feels uneasy to repeat these sentences, now in 2013. The text, on the one hand, reveals an exclusively touristic perspective. Its reflection on crime, and the fear of it that shines through the lines, underlines this perspective. These are the words of a tourist, who visits the places that he knows from television or from the books that he has read and whose real existence he proves by taking a picture of it. By this I do not want to deny the immense problem of crime in contemporary South Africa in any way; it is a huge problem. These are also words of a visitor who represents a politically correct stance - which he has learned 10 000 km away. For example, I refer to the founding date of the Voortrekker Monument in the 1930s, but any reflection on the situation of the Boers in the days after the South African Wars is lacking. My perspective on the South African Wars changed permanently through P.G. du Plessis' (2008) evocative novel Fees van die ongenooides and, in a sense also through Martin Bossenbroek's (2012) description of the war from a Dutch perspective. The complexity of South African history is simply a non-issue in my diary, whereas ironically my strong politically correct stance is not reflected in my travel scheme at all: the only outreach to non-White South Africans is a visit to a service in a Uniting Reformed Church in Stellenbosch. Moreover, the overwhelming kindness with which I was received by White colleagues, I have not associated with my political position. To put it in terms of the theory of autobiographical and autoethnographical theology, my autobiography, as it is reflected in my diary of that visit, had not yet developed into a 'transitional space' that negotiated its position in the world. My world was still in order. My position had not yet started to move, the past and present that are inscribed in my self-view of that time are very personal and mainly refer to my own memories of home and school and watching South Africa on Dutch television. My worldview is still well-ordered: there are 'goodies' and 'baddies'. Nevertheless, there and then I started to connect to South Africa and to the people there, although it was still mainly unreflected. During my latest visits, in 2011 and 2012, I took a taxi from my guesthouse close to the campus of the University of Pretoria and let the driver drop me off at the Pretoria Art Museum at Arcadia Park. As said before, during my first visit I was struck by the paintings of Pierneef, who so beautifully represents the South African landscapes with his violet and purple palette. I still like his paintings very much. But now the entire overview of South African art from the end of the 19th century fascinates me, as it reminds me of the many people and places - rural and urban, well-to-do and in townships or even in places without any facilities - that I visited, of what I learned from the history of South Africa and the Dutch, French and English interventions, which, in their turn, also became part of South African history. Happily, the greater part of the city centre could be explored on foot at that time and I walked with my wife from the museum to Church Square, where I had not been since 2001, although I have visited the University of Pretoria many times since. What a difference to my first visit! Now it was not a hasty photo moment next to a waiting car that could be my safe haven at any moment, but a journey on foot, lasting one morning, which was, at the same time, a feast of recognition and a rediscovery. Orientation was sometimes difficult, because of the politics of changing street names which had now been realised and which reflects the change of who-is-in-power. The atmosphere was cozy and pleasant, but I was aware that we should not have been here in the evening and so I had left my camera in the hotel. The very first thing that struck me was that the area was completely occupied by Black people and that the Western cityscape with its neatly swept streets had been replaced by a more improvised use of public spaces. Yet, in some places, modern Western-styled shopping malls had begun to appear, next to numerous hairdressers, blanket shops, clothing stores and street stalls with cellphones, herbs and aphrodisiacs, sunglasses, hats and shawls, CDs, toys, et cetera. Several people holding a billboard with small pictures of new haircuts invited us to come along. The old monumental buildings that were in the centre of White governance definitely had begun to crumble. Repeatedly during our walk, we stumbled upon a religious gathering. A speaker with a wide circle of listeners loudly and humorously testified of Jesus Christ, there was singing by live singers or electronically through speakers. It was clear we stood out as White people and my wife was addressed directly, albeit in a language that we did not understand, but laughing bystanders translated for her. A church of the Nederduits Gereformeerde Kerk had clearly undergone a remake in the past 10 years, as billboards in the garden made it clear that it now completely focused on HIV and/or AIDS topics. Our walk ended at Church Square. We found that the statue of Paul Kruger was still standing there, virtually unshaken. The green lawns that surround the statue had been transformed into family picnic places. On the tar streets that cross the lawns and circle the park, street performers entertained the public. 'Uncle Paul' was looking down on a new South Africa and we, walking in between, had become connected to that country. The changed meaning of my father's tobacco-jar simply mirrors the transformed significance of Van Wouw's statue on Church Square in Pretoria, which, at the present time, is part of the City of Tshwane Metropolitan Municipality. Back home, my father's tobacco-jar, which my mother gave to me after my father's death, looks at me, accompanied by Vermeiren's Vrou met Bokkie and Esther Mahlangu's Ndebele abstract. In Pretoria, the statue overlooks a square that finally has been appropriated by the new South Africa. In 2001, after visiting Church Square, we went to the Voortrekker Monument. Now, in 2012, we went to the hill opposite, to the new commemorative Freedom Park. I had promised myself that I would return to the park, because it includes nearly all themes that I address in this article and is therefore an excellent focal point to describe what is happening in South Africa and to thematise the 'otherness' of the country for an involved visitor from abroad. According to the Freedom Park website, amongst the objectives of the park are to 'contribute to social cohesion by positioning Freedom Park as a symbol of national identity in 70% of identified target groups', to 'establish mechanisms to promote, protect and preserve Indigenous Knowledge Systems (IKS)' and to 'mobilize active partnerships with continental and international institutions to emancipate the African voice' (Freedom Park 2013a). It is a place commemorating those who lost their lives in 'the struggle for humanity and freedom' (Freedom Park 2013b). There is not only a flame for the unknown victims and a wall with the thousands and thousands of names of those who paid for the struggles with their lives, but also 'a resting place for the spirits of those who died in the struggles for humanity and peace' (Isivivane) (Freedom Park 2013c), and a 'walkway . for meditation, self-discovery, healing and spiritual contemplation' (Freedom Park 2013d). From the Freedom Park, the Voortrekker Monument can be seen on the opposite hill. The two monuments are accessible with one admission ticket. The South African Wars, formerly known as the Boer Wars, are commemorated in the Freedom Park as well, as there could have been no new South Africa without the Boers. This, at least, is the message that is expressed by the park. Whether it is always lived that way in the country, is another story. The message of the park is that it reflects the new South Africa and so the Boers' history is incorporated in it. For me, 'Uncle Paul's' meaning as a symbol was reactivated in the past 12 years. In earlier years, it presented the familiarity of a father-son relationship and a vague memory of a greatgrandfather whom I never knew. Then it became a relic of the past South Africa of apartheid. Finally, the tobacco-jar became the symbol of the hospitality and friendships that I met in South Africa and of my commitment to the country and its peoples, of its complex history and blended cultures, from which the Afrikaners, with whom we Dutch have so many common roots, no doubt form part. And thus I no longer understand the touristic perspective of my travel guide: 'Church Square ... is the heart of the city ... A rather unattractive statue of a grim-faced, grizzled Paul Kruger stands in the middle ...' (Kellett & Williams n.d.). Professor Marcel Barnard is a research associate of Professor Cas Wepener in the Department of Practical Theology at the University of Pretoria. 1. Wepener and Vos (2013) speak of an 'uninhabited idealized' and 'pristine' landscape. 2. The project has an educational aim: it 'engages with Ndebele cultural achievement as inherited knowledge and skill. It shows educators how an awareness of their cultural inheritance can support learning in our schools ... Daunting textbook challenges are presented in a known context and learning becomes an adventure of self discovery, as it should be' (Lekgoathi et al. 2008:3).